A permanent lifeguard station could be built on Sandown beach, if the plans are approved by the Isle of Wight Council. The proposed site currently houses the old lifeguard unit, on the promenade. 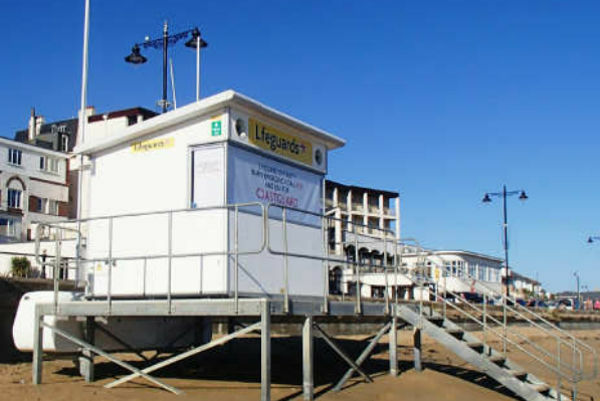 The RNLI is seeking permission to move the existing temporary station to the same location as the old council lifeguard unit, which is due to be removed. The old unit has not been used since the RNLI took over lifeguarding duties. Currently, the RNLI lifeguard station is removed from the beach and stored away during winter months. However, to reduce costs to the RNLI, the new lifeguard station would remain in place permanently. The design and appearance of the proposed lifeguard station are identical to the existing station. The development would require the employment of two part-time and two full-time staff, with two or three persons working per shift. The lifeguard station operates between July and September from 10am to 6pm, seven days a week.